Welcome to the second post of the Sea of Stars Quilt Along. Just joining us? The first post, about fabric selection, can be found here. As you have probably noticed, there's quite a few half-square triangles in this quilt. Half-square triangles are one of the most common units found in quilt blocks, with its popularity first rising in the 1800s, toward the end of the Industrial Revolution. Over the years, quilters have used many different ways to make half-square triangles, and it seems that every quilter has a favorite. My personal favorite method, shown here on my blog many times, is the 4-in-1 method, which is the method shown and used in the pattern. I prefer this method because it's quick, requires no prep work beyond cutting your fabric, and because it works well for me. 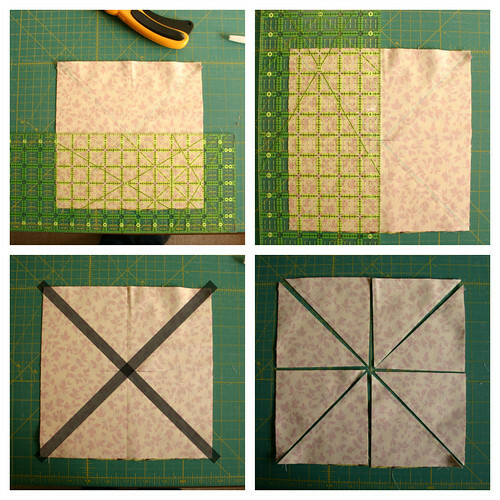 However, I've heard concerns from some quilters about the bias edges that the 4-in-1 method creates. Indeed, the edges of the half-square units created with this method do have bias edges, but I've honestly never had an issue with them. If your bias edges have an attitude and give you a hard time, a quick spritz of starch will make them behave. 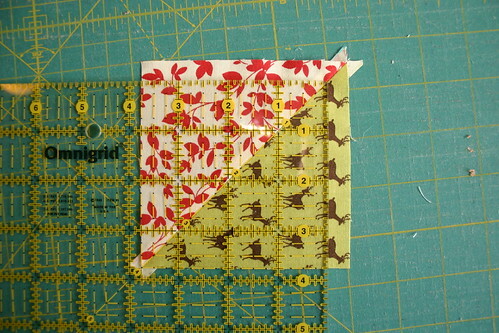 If the 4-in-1 method just isn't for you, let me show you a few other ways to put your half-square triangles together. The 2-in-1 method is an adaptation to the old school method of cutting actual triangles and piecing them together. Not that there's anything wrong with that old school method, it's just got a lot of room for error, in my opinion. The 2-in-1 method is the art of pairing two squares together, drawing a line with your chosen marking tool across the diagonal the lighter of the two squares, and sewing a scant 1/4" on either side of that line. Then, you cut across the drawn line to create two separate units, which you then press and trim. You may have seen this method before, but I do the math a bit differently, which allows for a little bit more wiggle room in trimming as well as a bit of math ease. 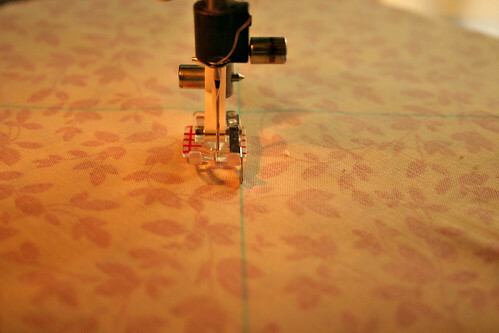 To determine the square size to start with for this method, simply add 1" to the size you plan to trim to. For instance, if I am going to trim my half-square triangles to 3 1/2", then I will need 4 1/2" squares to create those units. The 8-in-1 method is quickly gaining popularity in my sewing room, thanks to Cherie, who introduced it to me earlier this year in her Carpenter's Star tutorial. The only downside of this method is that it does take a bit of math-related brainpower and a few moments with your chosen marking tool. This method is much like putting four of the 2-in-1 method squares together to create one large square that will ultimately yield 8 identical half-square triangle units. So, if I want to trim my half-square triangles down to 3 1/2", I would want to cut two squares measuring 9". Then, I would take my lighter square, and mark a line down both of the diagonals of the square, for a total two lines. I would then stitch a scant 1/4" to the right and left of each of those two lines, for a total of four seams. To trim this block properly, I would first trim the squares in half lengthwise and then widthwise. 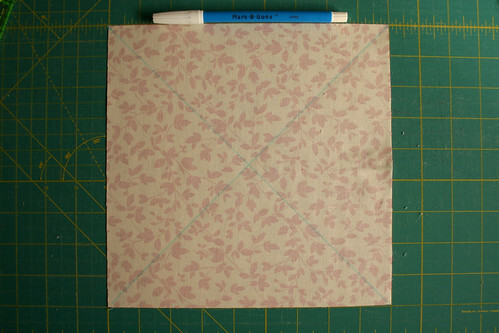 Without moving the cut units, I would then cut along the lines that I drew on the light square, creating eight half-square triangle units to press and trim. Regardless of the HST method you choose to use, to trim your HSTs down to the size you need, simply use a square ruler with a 45 degree marking on it. Align the seam in the center of your unit with the 45 degree marking, and then align the raw edges with the proper markings for the size you want. Typically, I first trim as shown in the picture below, going 1/4" larger than the size I truly want. I then rotate the unit and ruler and trim the remaining two raw edges to make sure my unit is the proper size. Do you have a favorite HST making method? Or one I didn't discuss here? I'd love to hear about it! 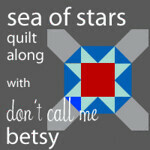 The next Sea of Stars quilt along post will be on December 14th. 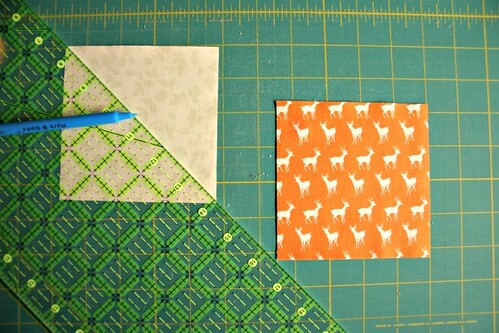 Go ahead and start cutting and tackling your half-square triangles, with whatever HST method you prefer to use. On the 14th, I'll be sharing some tips for creating your flying geese units. Have a great day!